That looks so incredibly lightly built that it’s almost a joke! And that weird disparity between upper and lower jaws’ teeth..
I’m delighted to hear of good 3D preservation. Indeed, there must be many fascinating revelations to come. Yeah, it’s pretty crazy. But the morphology is legit, with only a little wiggle room for the missing bits they had to reconstruct. But I’d say it’s only about as crazy as an ostrich or pelican skull, both of which feel like they are made out of very stiff paper. As Ali G would say, flying tetmapods – is they good, or is they wack? Well, that’s just astonishing: 3D preservation for material like that! It’s almost enough to make me want to work on pterosaurs. Almost. 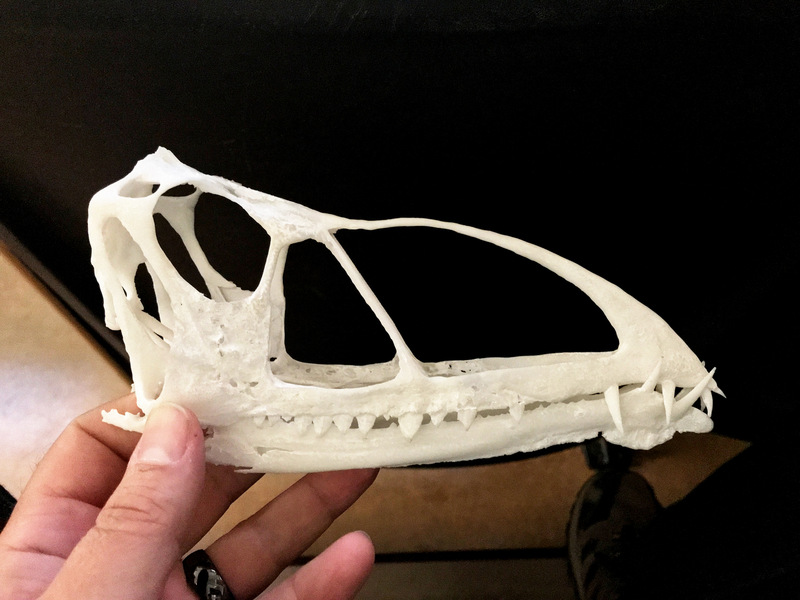 I’ll have to go over the known bones closer, but neither of those skull reconstructions looks “right.” Almost like they were trying to square the weird jugal with a typical Dimorphodon skull shape. Could the post-snout skull roof simply be taller to match the snout? I’ve been super excited about Saints & Sinners for awhile now, especially regarding the drepanosaurs. SOMEBODY PLEASE DESCRIBE THE DREPANOSAURS. Excuse me, where can I download download the 3d file to print a copy of this skull? Beats me. I don’t think a 3D file has been published yet. I only got to see this because the lead author had it with him at the conference I attended last weekend. I found to my shock there are 8 posts under “stinkin’ pterosaurs” at SVPOW. I wonder if you need a refresher on ‘How to tell a pterosaur from a sauropod.’ There’s a good video on youtube on this by Anne Elk. More seriously, cool stuff. Saints and Sinners sounds amazing. I am going to take a walk now in the hope more exercise will extend my lifespan just for that!